There's always something new happening at the WIFS NYC Chapter. So be sure to check back regularly, and join our email list to stay up-to-date. WIFS-NYC Chapter New Year Meet & Greet! Reinventing Yourself & Your Life! LEARN & INTERACT with Noreen Sumpter, our keynote speaker. Noreen is the founder of Live Life Your Way, where she works with men and women to find their power and live powerfully. Her passion for personal growth and development inspires others to Own Their Voice, Speak Their Truth and Live Life Their Way. 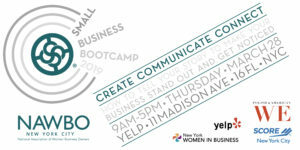 NAWBO NYC invites you to our annual Small Business Bootcamp on Thursday, March 28, 2019. Join us for a day of networking, interactive discussions, and hands-on workshops focused on how to make your business stand out and get noticed. Click here to register & learn more! Impostor syndrome is a dirty little secret that many high achievers share. Deep down they may feel like complete frauds. They may believe their accomplishments happened because of luck or that they are a failure despite evidence of their abilities and success. The good news is that impostor syndrome is a feeling, not a life sentence and it can be changed and altered! Learn strategies you can use every day to pivot away from impostor syndrome and live the life you want. Join Anchin Private Client for a wine and cheese networking event, featuring guest speaker Susie Moore, Tech Start-Up Advisor and High Performance Coach. Celebrate Hispanic Heritage Month with WE NYC, in partnership with Columbia School of International and Public Affairs & New York Women in Business, and gain insider tips on how to succeed as an entrepreneur! This event will feature a fireside chat between Nathalie Molina Niño, author of LEAPFROG: The New Revolution for Women Entrepreneurs, and Michelle Herrera Mulligan former editor-in-chief at Cosmo for Latinas. Nathalie Molina Niño, founder and CEO of BRAVA Investments and WE NYC Advisory Council member, is a serial tech entrepreneur and a proud daughter of Latinx immigrants. FinTech Media is a brand new event created exclusively for public relations and communications professionals in the financial community interested in meeting journalists covering FinTech. Based on our BAM events held since 1998 for universities, FinTech Media allows financial professionals to personally network with business and financial journalists in one place, at one time. The reporters and editors speak on three panels throughout the day. During the panels, the journalists will discuss their coverage areas in banking, finance, and FinTech and answer questions from the audience. We limit the audience to less than 100 so that after each panel, every attendee can meet each journalist. FinTech Media is produced by Wynne Events and KikiNetwork. What Does Your Business Wardrobe Say About You? Should Your Client Enroll in Medicare? Girlfriend’s Guide to Divorce: Knowledge. Support. Empower. WIFS is committed to our mission to attract, develop, and advance the careers of women in the insurance and financial services industry. Join the NYC Chapter today to gain access to our wonderful member benefits.